The rich quality of natural hardwood floors, provide that upscale appearance to any home (Figures 1 and 2). The floors are enhanced with age as they develop rich patinas that are unlike any other flooring material or any other floor – every hardwood floor is unique. With a quality that has endured through the ages, hardwood floors are rugged and relatively easy to clean and maintain. Maintaining the natural beauty of hardwood floors is an excellent home improvement project that can add real value to your home. Dirt, grit, and sand are the biggest enemies of a hardwood flooring. They create fine scratches on the finish and can imbed themselves in the finish and the cracks between slats or boards. In order to prevent any dirt, grit, and sand from scratching and dulling the surface finish use a vacuum with a non-reciprocating brush attachment regularly. I do not recommend the use of an upright vacuum that uses a reciprocating brush as the brush itself can scratch the surface of the floor. Once or twice a month use a very lightly damp (not wet) mop to clean grime. I also do not recommend the use of products such as the dry mop Swiffer, as these types of mops push the grit and sand under a cloth and across the surface and can act in a similar manner to sandpaper. The use of small area rugs and doormats will protect the hardwood flooring in high traffic areas and capture dirt and sand prior to them damaging the finish of your hardwood flooring. Today’s hardwood flooring is finished with high durability polyurethane, which is somewhat impervious to moisture. In most cases, this finish was applied to the slats or boards prior to installation, which means that the joints do not have any sealer protecting them from water ingress between them. Older hardwood flooring may be finished with wax or varnish. Whatever the finish, any liquid, or food spills should be wiped up immediately with a damp cloth followed by a dry clean towel – absorbent paper towel works well. 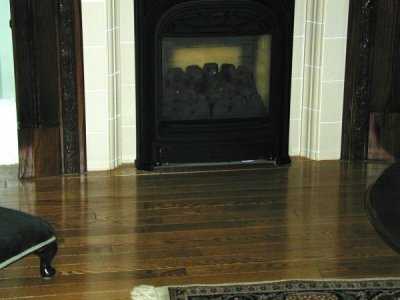 If liquid is allowed to sit on hardwood floors, it will seep between the slats or boards, which could cause warping or even worse, rotting to occur. In some cases even after reacting to a spill quickly you may see a water stain. Use a wood flooring cleaner to remove the water stain. Do not use liquid soap. Rinse the wood flooring cleaner with a mild solution of vinegar and water and then wipe with a clean cloth or paper towel. If the stain persists you can use some ultra fine sand paper, 600 grit, or some #0000 steel wool. Use the sandpaper or steel wool and rub very gently in line with the grain. Once the stain has been removed you can buff with a clean cloth and if necessary wax or apply polyurethane or varnish which ever matches the original finish. Every few months your hardwood flooring should be cleaned with a hardwood flooring cleaner in order to remove accumulated grease and grime. Always use a floor cleaner with a neutral pH. Never apply ammonia-based cleaners, liquid soap detergent or any cleaner that has an abrasive substance in it. Any of the aforementioned cleaners will damage the surface finish and in some cases actually strip the finish from the flooring. If your hardwood flooring has a wax finish, it should be buffed once or twice a year. Scuffmarks that occur on waxed floors can be removed with spot buffing, if and when required. Hardwood flooring with a polyurethane finish never needs buffing and it should not be waxed. Use felt pads under furniture legs and feet in order to prevent your hardwood flooring from being gouged or dented. Try to avoid dropping sharp or heavy objects as this may cause gouging and dents to occur. UV rays from the sun will fade and discolor hardwood flooring. A polyurethane finish on your floor should protect it from fading from UV rays coming through windows. However, varnish and wax both yellow when in direct sunlight. If you are unsure of the finish on your hardwood flooring, it is probably wise to close drapes and blinds in order to block the UV rays from direct contact with the hardwood flooring. Sunlight is known to change the color of some hardwood flooring dramatically. Hardwood flooring is a major investment and to keep it looking like new for generations to come a little tender loving care is well justified.